December | 2012 | Confessions of a "None"
Protected: Goodbye to 2012 – Hello 2013! We laid my partner’s grandmother to rest today. The funeral was beautiful and the ceremony was just what she would have liked. Lots of crying, hugs, and emotionally drained drives later, we are at home, reflecting on the last few days. The sad loss of a grandparent, but the great time we had as a family of three for the first time for Christmas. On Christmas Eve, we gathered with the huge family that is Kim’s side of the family at her grandfather’s home. It was a bittersweet moment, realizing that her grandmother was not in the chair she always sat in. Her familiar hug was not available. Her smile was not there to brighten the room. It was nice to have us surrounded by family, and Peyton got to play with her cousins that she hasn’t had near enough time lately to play with. 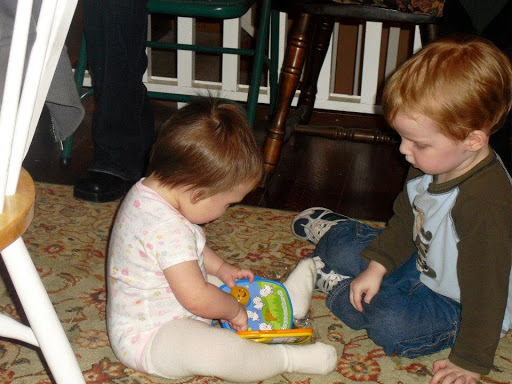 Playing with her 2 year old cousin. 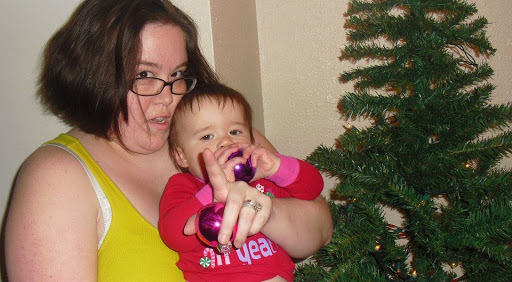 Being held by a family member and poking at her cousin whose a few months younger than her. 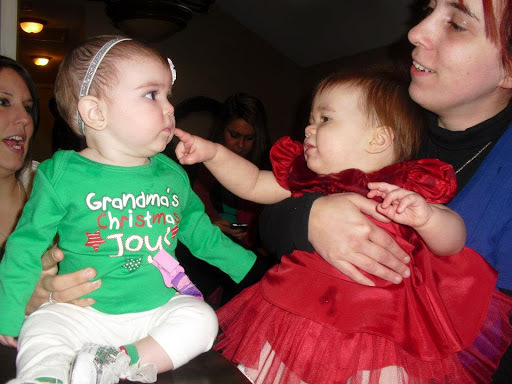 Now that Peyton is getting a personality, its great to see her interact with other babies and kids. She freaking loves older kids, she just giggles and dances around them. With babies her own age, she just pokes them in the eye or tries to steal their binky. 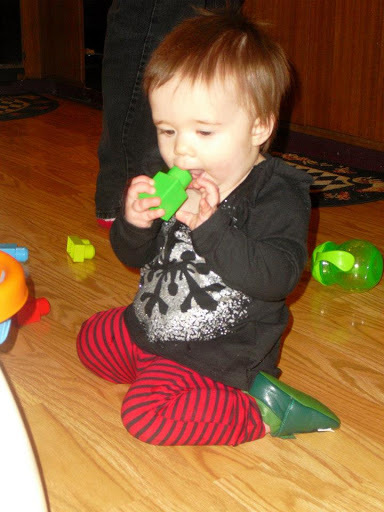 She doesn’t even take a binky and she steals theirs in a heartbeat and sticks it in her mouth. Its so weird. 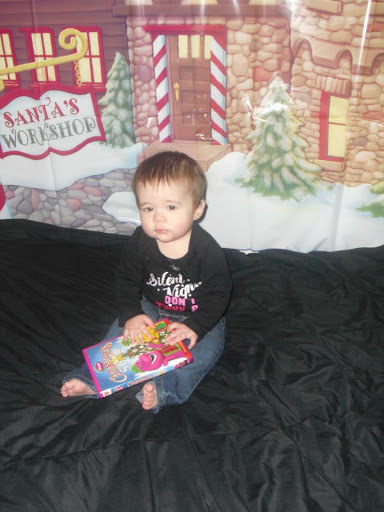 On Christmas, we woke up bright and early and got under the tree for presents from Santa and her mommies. 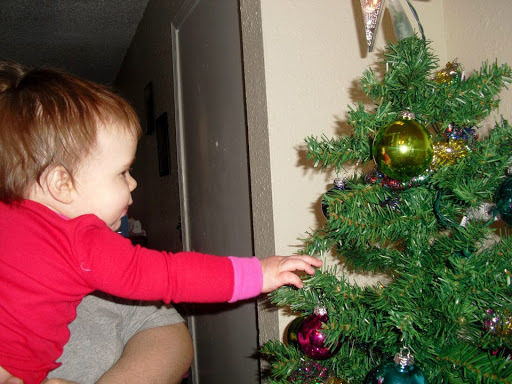 Right now, she is too young to have to worry about the introduction of what other people think Christmas is about, our family is just celebrating the holiday and the tradition. 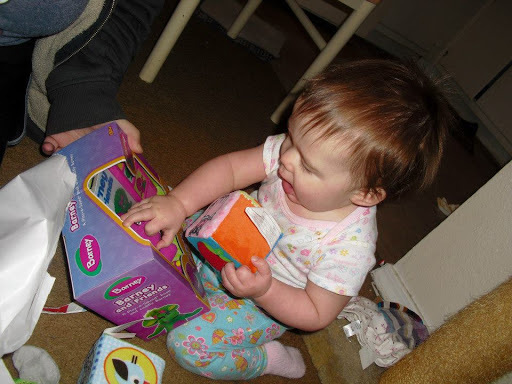 Peyton didn’t really care for unwrapping presents, but once she saw a new toy inside, she was all about getting it in her hands. Here are two of my favorite, unwrapping presents moments. 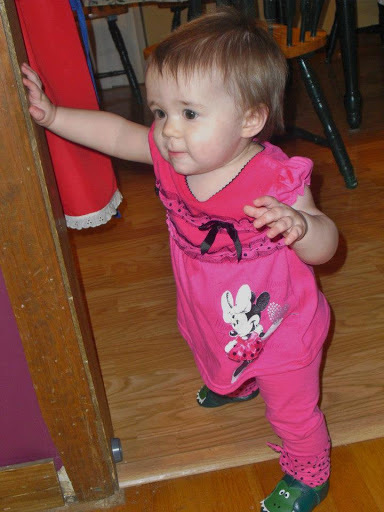 Later in the day, we took her over to her Papa and Mimi’s house. Kim’s dad and step-mom went crazy with the presents and it was awesome to see. We just got back in touch with them and I am so glad that we did. That side of her family is just another extension of the love and beauty of Kim’s family. More great people to love Peyton with everything in their hearts. Eating a block in the kitchen floor. 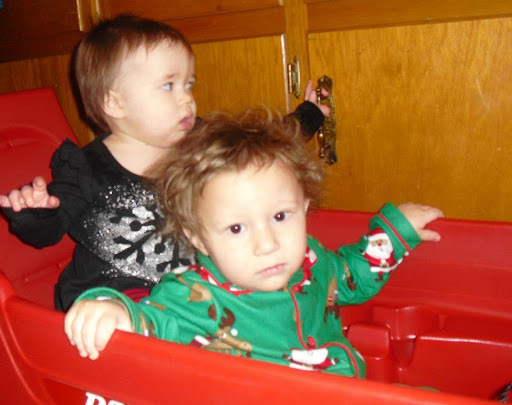 Double trouble in a wagon. She wanted in the cabinets, he wanted her out of his wagon. Peyton starting cruising all over the house, starting here. So, we may have laid a great woman to rest today, but we had a nice first Christmas as a family as well. I go back to work tomorrow, so that should be interesting. I have been out of work for 8 days. I don’t know if I am ready to go back to work or not, but I’m going! Christmas is over and New Year is upon us. Can’t wait to see what 2013 has in store for our little family. 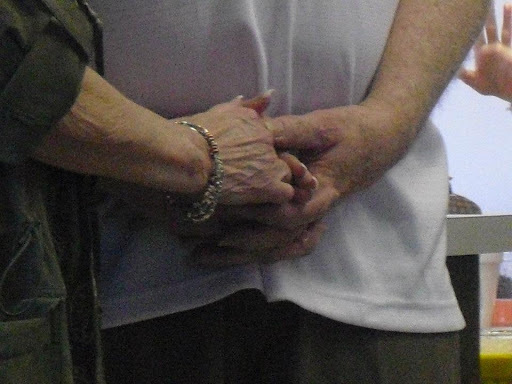 With the recent loss of my partner’s grandmother, we are all still reeling from the sadness. Our family is still mourning a great loss. That makes this Christmas season so bittersweet. 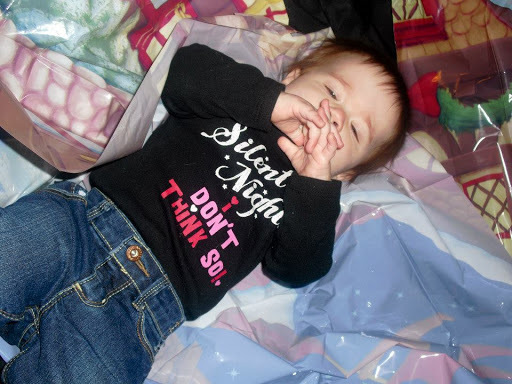 Its also Peyton’s first Christmas. Our first Christmas as a family of three. This month, we have made the most of the firsts in this year. I hope to make as many happy memories as we can for Peyton to look back on. So, earlier this month, we met with Santa and Mrs. Claus. Santa was not exactly the best person of the day. Peyton promptly screamed her head off. She was quite pissed that I plopped her down on some random bearded stranger’s lap. Mrs. Claus was not much better. Peyton wasn’t thrilled to be put on her lap either, but Mommy was determined to get the picture. So handing her a book and she chewed to her heart’s content. I had to buy that book afterwards. Happy early Christmas present Peyton. So, now that she has met the two most iconic characters of Christmas, I was very happy to have those pictures. 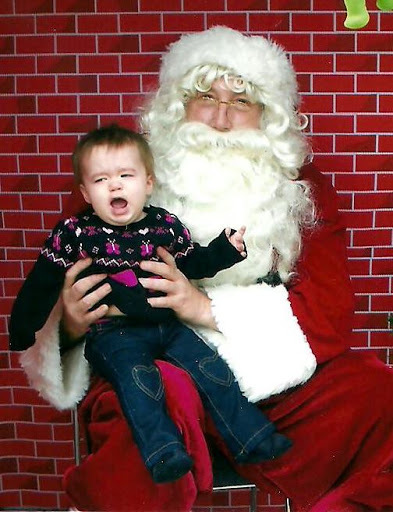 I love the screaming Santa picture. I am sure I shouldn’t love it, but I do! We tried to take her weekly pictures in front of Santa’s workshop, though, that didn’t really work out well, she ended up tearing down the background. It was still a cute little photo shoot to do with her. She loved the crinkle of the plastic in her fingers and playing Peek-a-Boo in it. It was great fun for both of us. The other day, we had a nice fresh snow. The first of the year, so I bundled up the baby and put her out in the snow. I am not sure what she thought was going on, but she tried to taste the wind. We didn’t stay very long outside because the wind was pretty cold and biting, but I wanted to get the pictures. 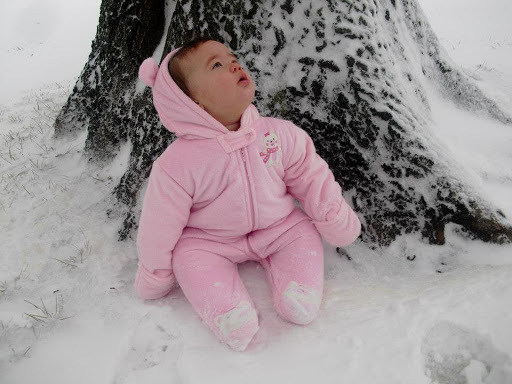 So, we got a few pictures of her playing in the snow. In the midst of the sadness, we were able to put the Christmas tree up and have yet another first in our family. We have wrapped presents and put them under the tree for the first time! Usually, Kim and I are not very good at keeping presents under the tree. We have put the tree together and let her help in her own little way. She put most of it in her mouth, but it was nice to take the pictures and keep the memories. 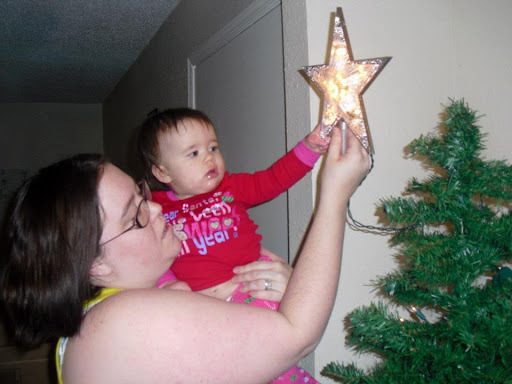 Putting the star on the tree. Helping her mommies put the ornaments on. 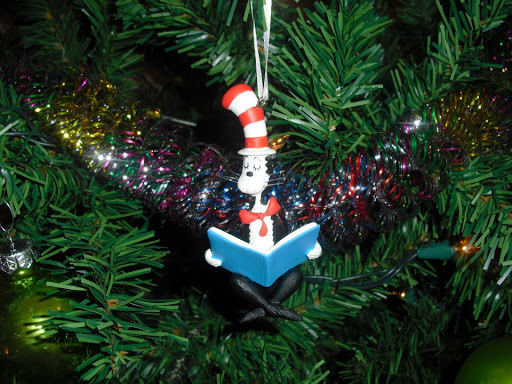 I hope everyone has an awesome Christmas Season, we are sure to have one as well. I am thinking on the things that are floating around the internet right now. Everyone weighing in on the big debates when something like a school shooting happens. I will say, for my own personal self, I hold my kid a little tighter now. Never has something that happened so far away and to perfect strangers affected me in such a way. I suppose that’s what being a Mommy does to you. It changes the way you think. So, I came across this article, posted by a friend on my Facebook feed. Its about not using medication to treat mental illness. I am not sure if the writer of this post is fully understanding what it actually means to have a mental illness. I understand that she has ‘clinical background’ and that’s all well and good, but this was an extremely biased article with the clear stance against medications. Look, I understand that there are people who go to doctors who start with medication. Who prescribe medication that may not be necessary Yes, I understand that medication is being used with a high frequency in our country – but it doesn’t mean that there aren’t people who benefit from these medications. I know this firsthand. This quote from the article baffles me. Yes, there are some genetics that can cause the onset of a mental illness. However, how can this writer say that there is no evidence of any chemical imbalance to account for mental illness. She has not sited any studies or psychological journals to give the opposition to this. She just started making statements without any scientific backing. That makes this her own personal opinion. Most of the research done on psychiatric illness and treatment is based in theory and opinions. Frankly, we don’t have enough studies on this subject and the stigma on mental illness is so ridiculous, no one wants to touch it. Well, let me tell you my opinion. My partner is BiPolar. I have Anxiety. No, we are not “Adam Lanza”. I would not even attempt to compare us to him. I wouldn’t want to. However, this brings me to another quote in this article. Really, so explain to me about my family member who attempted to kill herself five years ago and she was not medication. We got her help. We got her on medication and now she deals with things better. No to psychiatric drugs? We tried that for a year and she slowly started to spiral out of control. No to vaccines? Sorry that I vaccinated my kid. I will continue to – its our duty as a community to vaccinate against those outbreaks that are widespread. I worked in a mental health facility as well. I worked with a lot of “Adam Lanzas” as well. You know what I saw? Medication working at its best. Those people had killed their families, they had done unspeakable things and yet, with therapy and medication they were starting to be turned into normal people. They were functioning like normal people. They did some strange things, sure, as it was not something they could control. However, they were functioning. This isn’t about guns, though that’s another debate I wish not to tackle, this is about mental health care. We need to look at the way that society looks at mental illness. I am not an advocate of strictly medication to ‘numb’ people. I am an advocate of getting people the help they need – which may or may not include medication. To tell people they shouldn’t be using medication, is irresponsible. Its not helping anything. I’m appalled that there are people out there that are telling others how to manage a disease or illness they likely don’t know anything about. You can study it all day and you can still not know for sure what’s going on in the mind of a schizophrenic, of a person with anxiety, with any sort of illness you can’t see on the outside. So, before you start giving advice to people that borders on the biased and the judgmental take a walk in their shoes. Oh. Can’t get inside someone’s head, right? Well, then maybe you should take a step back and let these people manage their minds without your opinions and stigma. Just because society feels as though mental illness is a nasty topic to discuss, these are people we are talking about. These are human beings. Let’s give them the common decency of treating them like people and not like their illness. I do not excuse what was done in Connecticut. Not at all. I don’t excuse the actions of a man with an illness. I don’t blame the illness, I blame the man. This is not about excusing the man and saying that having a mental illness allows you to shoot up an elementary school. This is about making it less of a stigma to get the help you need. Its about making mental health care more accessible to our fellow Americans. Its about giving people a chance to be good people before they do the most unspeakable things that this man did. I love that no matter the mood of the room, the emotions of other people – Peyton makes everyone smile. She calms me and makes me feel lighter when the world feels like its on our shoulders. Two days ago, we found out that Kim’s grandmother is failing in health. 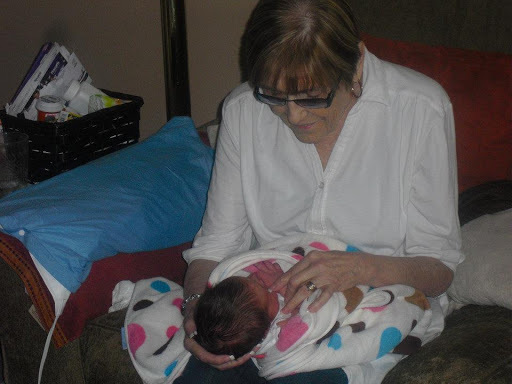 She has been moved to Hospice and the family is waiting for her to pass away. I have known this woman for 10 years. She has been the rock of Kim’s family their entire lives and I feel as though I have had her in my life since day 1. She is a special person. A person of excellent love and compassion for others. She has lived a long life of love and laughter, sorrows and sadness. The one thing I will always remember and love about her, is the day she took me in her arms that very first day she accepted me into the family. She didn’t have to accept me. I am not blood and I am not married to Kim. She didn’t have to hug me and welcome me with open arms. When we are in a relationship that some families don’t approve of, that some families are upset about, it can be complicated when family is involved. She didn’t make it complicated. 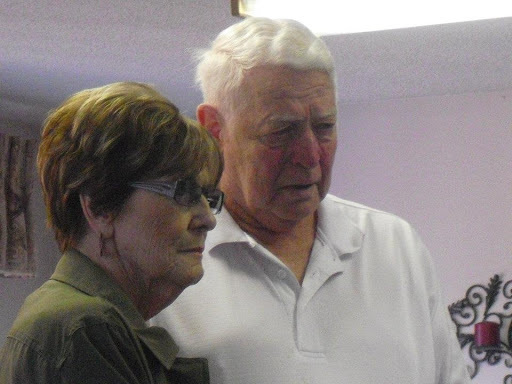 Kim’s grandmother was the glue that held this family together. A family that I am proud of be a part of. My extended family when my own family is not able to be here with me. I love each and every one of them and I am so thankful to have them in my life. Each of them, her grandmother included has accepted me and our daughter Peyton as family no matter how much blood is not shared between us. The bonds will always be there. 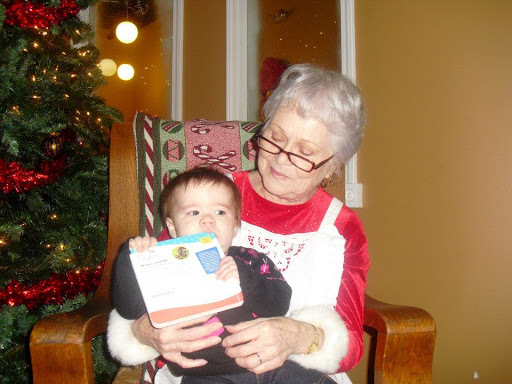 Peyton meeting great-grandma for the first time. I sit here by the phone, waiting for the call. A few hours of calm and then the flood of tears as I remember that we are going to be losing someone very shortly. Our time with her is incredibly short and yet the memories are long-lasting. I’m so glad to have Peyton with me right now, because when I am sad and upset, I can pull her up in my arms and hug her tight. Her babbles and her kisses can make me smile again. It saddens me that she won’t get to know her great-grandmother in the way I do. However, I will promise to teach our daughter to love as her great-grandmother loved. Unconditionally and with judgement. Here’s a goodbye and a goodnight, Benita Gilio. I love you. I cherish our time together. You are a special kind of person and I hope you find your peace sooner rather than later, because I can’t bear to see you going through this right now. 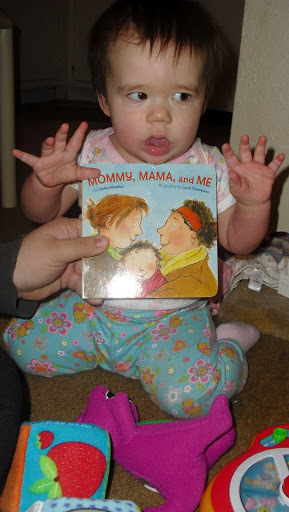 Protected: So, Our Daughter Calls Me Dada. Protected: Quick Catch-up and Peyton will be 9 months!